As a well-known tourist destination, the Diamond Head State Monument is a beautiful national landmark on the Hawaiian island of Oahu, which people from all over the United States come to visit. Diamond Head earned its name from early British sailors, who mistook calcite crystals as diamonds embedded in the rock. Part of the Honolulu Volcanic Series, Diamond Head’s dormant nature makes it a perfect hiking spot and perhaps one of the most beautiful volcanic craters in the world. Diamond Head is a defining feature to both tourists and natives of Oahu, where the crater originally served as a military reservation, since then leaving behind multiple stairways and military bunkers along its hiking path. Diamond Head attracts adventurers and outdoor enthusiasts alike to challenge its rough hiking trails, while all those who make it to the summit will experience the vast beauty of the island and expansive views of the blue Pacific. In addition to the beautiful hike, Diamond Head’s close proximity to Oahu’s white sandy beaches and extravagant hotels is what makes the area a popular tourist destination. 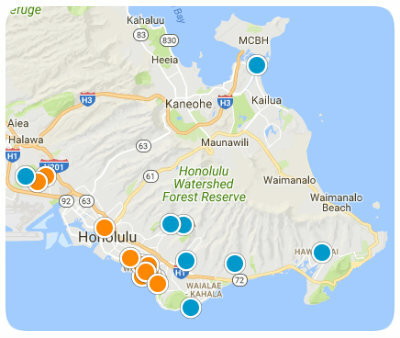 Closeby is the capital of Honolulu, where numerous restaurants, shopping centers, schools, and parks offer their amenities to local residents. As one of Hawaii’s most famous icons, home buyers from across the state of Hawaii desire to live near this majestic landmark. Numerous towns such as Waikiki, Kaimuki, and Honolulu lie at the base of Diamond Head, with gorgeous views of the crater. Whether you are searching for a beachfront estate near Waikiki Bay, or a cottage tucked into the foothills of Diamond Head, you will fall in love with your dream home on the south shores of Oahu. Surrounding Diamond Head, there is an abundance of beautiful neighborhoods such as Waialae and Kahala, each with single-family homes, townhomes, and condominiums to choose from. Due to its nearby beautiful beaches, relaxing lifestyle, and diverse real estate, the Diamond Head area is a wonderful place to call home. If you would like more information regarding homes for sale near Diamond Head, Hawaii, please allow us to assist you and contact us today.